Secluded executive suite located on the banks of the world famous Kenai River. ~Large Freezer for Your Freshly Caught Fish! Let us help you plan your Alaskan adventure! We have had the awesome privilege of living in Soldotna for 30 years. After raising 4 children and retiring from the fire department as a paramedic/engineer, we are loving this season in our lives.......... fishing, golfing, and enjoying grandchildren. We also enjoy helping our guests plan their Alaskan adventure! Soldotna is a perfect location for your Alaskan adventure! Whether your desire is to fish or hike or kayak or go birding, we are at the center of it all! Just a 3 hour drive from the Anchorage airport, Homer is 70 miles down the road, Seward is 90 miles and only 1 mile from downtown Soldotna to your door! Standing on the deck, there is not another building in sight. Just the bird filled trees, the beautiful Kenai River with all of it's abundant fish, and the woods & the tops of the mountains towards Anchorage. Great hiking trails right outside your door or take advantage of the paved bike path that goes right into Soldotna. It is common to see eagles & moose along with other wildlife. Across the River from Soldotna with a wooded view of the River and the mountains towards Cooper Landing. Abundant supply of linens and towels. Full size washing machine with detergent and various laundry and cleaning products. Full size dryer with iron & ironing board. Available to rent in Soldotna. Fishing & Clamming Equipment Available, Large Freezer, Hiking Trails, Guide Recommendations, Lots of Alaskan Books & Magazines, Thermos and coolers. 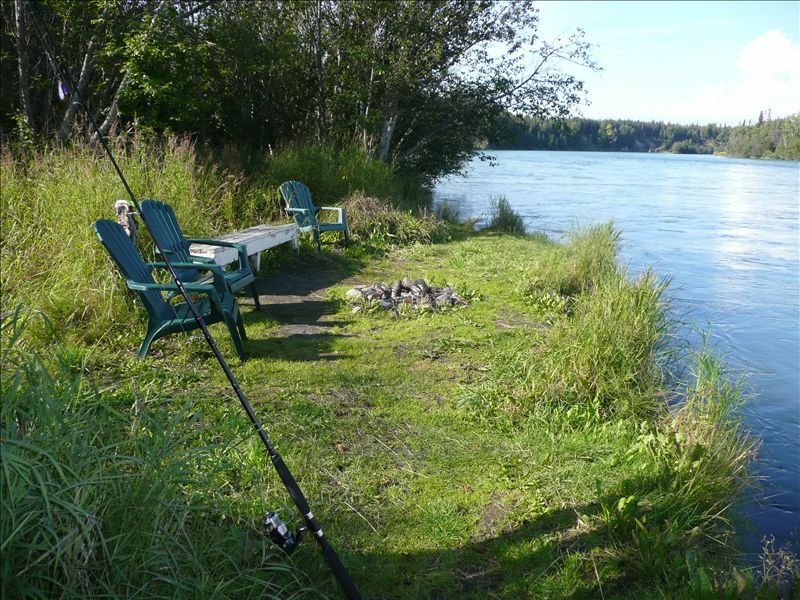 Kenai river is just down some steps and along a walkway where you can fish or enjoy a 6 hour sunset (dusk) and watch the numerous bald eagles after dinner. The river was very high, deep and very fast during our stay, so wasn't able to catch fish, but owner has courteously provided access to rods/reels for use (provide your own terminal tackle). Also, a freezer is available for fish you might catch there or from taking any of the numerous nearby guided tours. Condo is well furnished for cooking and there is a pay washer/dryer available. Deck is great (partially shared with other unit) and has nice barbeque which we used nightly. The unit is on a very quiet, private street, but main street Soldotna (Safeway, etc) is just a couple of miles away. Janet and Marv live just next door and are very accommodating. We were unsure of our time of arrival (driving from Talkeetna) but Janet provided excellent instructions on how to find and access the unit. They are as available/responsive as you need them to be and likely great resources for information on local services/guides/etc. In addition to the fishing equipment available, there is also a basketball hoop in the driveway, badminton rackets/birdies and a nice lawn area (with swing set) next to the wide, flat parking area in front. One note: I mentioned that the river was high and fast (running 15mph according to local guide) during our stay. As shown in picture of chairs by bank of river, there is no fence or barrier (nor should there be given focus on preserving natural riverbank) so need to be careful and parents in particular should not allow children to play/run or be unattended in this area if water is up. Look forward to staying with Jan and Marv again. Janet is absolutely wonderful. Very helpful and accommodating. The view of the Kenai is incredible. We thoroughly enjoyed our stay. Wished we would have stayed longer. Loved the view of the Kenia River from the deck and would have fished the river bank if we would have stayed longer. Janet greeted us with a filet of salmon which I cooked on the BQ, it was the best salmon we have ever eaten. Janet made great suggestions on who to call for a guided river fishing trip and a day of touring the Kenai Peninsula. We were provided with cooking utensils and dishes for fixing crab and any gear we might need for keeping dry on the river banks or in the boat. Thank you for helping us make the most of our way to short stay. Hope to come back! We just returned home after a two-week Alaskan vacation that included three wonderful days at this lovely condo. Almost better than being at home, this property is beautifully decorated and sunny with great views from the balcony. So very comfortable you can't help but relax from the moment you arrive. Our host, Jan, was very accommodating and available as needed for any special requests. Kenai Peninsula has to offer. We can't wait to return again! We have stayed in places all over the world and the Kenai River Retreat is now one of my favourites. We were in one of the upstairs 1 bedroom apartments which was very comfortable, well equipped, tastefully furnished with a flair for the outdoorsy motif and with a balcony overlooking the Kenai River and passing bald eagles. You can fish for salmon just below on their own private property of the riverbank and they even have some fishing equipment you can use. How cool is that ! Access is easy and in front of the house is a large parking area. Everything is well maintained. The owner/hosts live in a house right beside so you get a level of service, security and help you do not get with absentee landlords. There is no dining table but instead is a counter with several chairs and a small table on the balcony for al fresco dining. Nearby in the town there is a good selection of restaurants, shopping and services. We travelled to the Kenai for the scenery and to fish both of which are excellent. Many good local guides are available which is a good idea if you are not familiar with the area or fishing regulations and techniques. We were pleasantly surprised at the size of Soldatna and the number of stores, supermarkets and services. Communication with the owners was always timely and pleasant and we even shipped a pair of fishing waders to Janet at her suggestion so we would not have to travel with them. The only thing that was missing - more time to stay there ! I highly recommend this place.